Daylight Saving Time (DST) ends at 2:00 am local time this coming Sunday morning in most of the U.S., whereupon we return to Standard Time (ST). The event, as with the beginning of DST in March, always elicits a lot of debate over whether DST is necessary in the 21st century. I would prefer to end the inane biannual ritual for reasons illustrated in the graph I created in Excel*. Daylight Saving Time is not observed everywhere across the globe, and where it is observed there are variations in when it begins and ends. In the U.S., DST begins the second Sunday of March and ends on the first Sunday in November (which is this coming weekend). Only Arizona and Hawaii do not participate. Standard Time all year (ST, green line). Note the time difference between the curve maximum and minimum for comparison to the other two cases (both for sunrise and for sunset). Daylight Saving Time in the manner currently implemented in the U.S., with changeovers occurring as noted above (DST, blue line); i.e., an hour is added on the 2nd Sunday of March and removed on the 1st Sunday of November. Note that the time difference between the max/min for the clock time of sunset is much greater than the ST value. Note also that the time difference between the max/min for the clock time of sunrise is much less than the ST value. 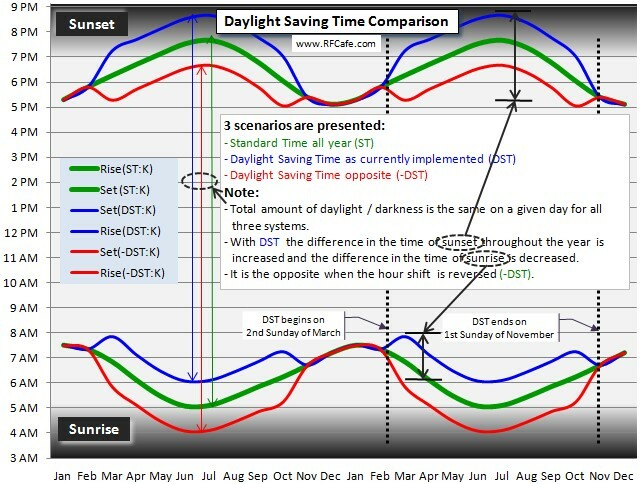 Daylight Saving Time opposite of the manner currently implemented in the U.S., with changeovers occurring as noted above (-DST, red line); i.e., an hour is subtracted on the 2nd Sunday of March and removed on the 1st Sunday of November. 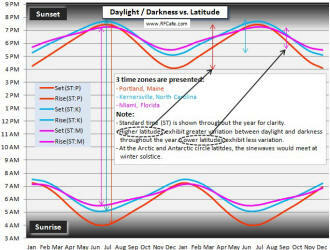 Note that the variation in amplitudes of sunrise and sunset are reversed. Personally, I find the amplified differences in the times of sunset because of DST to be annoying. 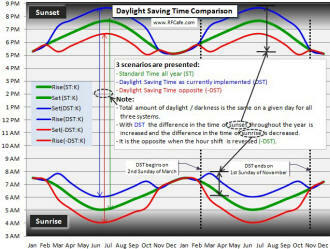 Swapping to the -DST system (my invention) solves the problem and reduces the sunset clock time variation throughout the year, but then the clock time of sunrise exhibits the amplified variations. That situation could prove to be equally annoying to people who are awake more in the morning hours than in the evening hours. The blackout curtains on my bedroom windows would effectively mask the early morning sunlight caused by the -DST system, so I would prefer it over DST if we must endure a time switch. However, I would much rather prefer that we dispose of Daylight Saving Time altogether. It simply is not required in the 21st century. DST was first implemented in the early 20th century when the U.S. was more of an agricultural society and the argument was to give farmers more daylight in the morning when they traditionally performed most chores ... or to conserve energy in wartimes, depending on whose account you believe. Congress has adjusted the start and stop dates multiple times in the last century, and even did away with it for a while, only to bring it back during the energy crisis in the 1970s. It is time (pun intended) to do away with it for good. I created a second chart that does not pertain to Daylight Saving Time, but instead illustrates how the latitude on which you live affects the amount of daylight and darkness you experience throughout the year. Sunrise and sunset clock times were plotted for three widely varying latitudes in the U.S.: Miami, Florida; Kernersville, North Carolina (where I once lived); and Portland, Maine. As shown, the nearer to the equator you are located, the less the variation in day/night throughout the year, and the nearer to the poles you are located, the more the variation. At the Arctic and Antarctic circles, there is no sunrise on the winter solstice and there is no sunset on the summer solstice. At greater latitudes you will experience the 'midnight sun' on days surrounding the summer solstice. 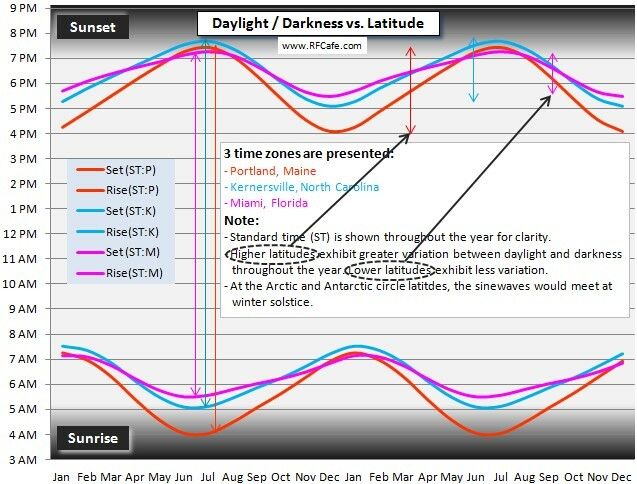 For a given latitude, changes in longitude does not affect the amount of daylight and darkness on a given day, only the clock time at which they occur. You might also be interested in an article I wrote a couple years later titled, "Daylight Saving(s) Time vs. Standard Time." * Data obtained from the the U.S. Naval Observatory website.